Directors & Impressarios: Vsevolod Meyerhold, cont. 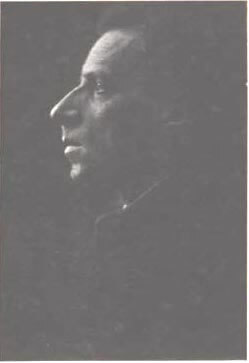 Above and to the left, a photograph of Meyerhold taken in the first half of the 1920s. Next to it is the 1922 poster announcing the production of The Magnanimous Cuckold by the Belgian playwright Crommelynck at the Actor's Theater, Moscow. 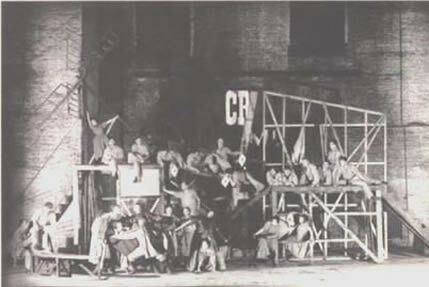 Above left, a photograph taken during the 3rd act of the play showing Liubov Popova's celebrated constructivist set design. 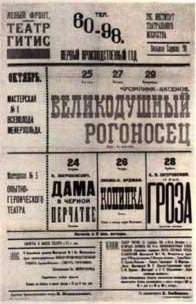 The poster below it announces Meyerhold's 1922 production of Sukhovo-Kobylin's The Death of Tarelkin.